The International Space Station is featured in this image photographed by an STS-133 crew member on space shuttle Discovery as the shuttle approaches the station during rendezvous and docking operation on Feb. 27, 2011. This story was updated at 1:11 p.m. EST. 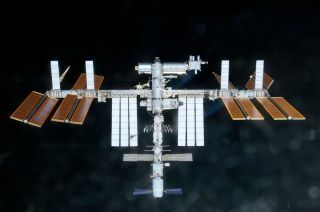 Due to safety concerns, a proposed photo session at the International Space Station that would have captured a historic view of the orbiting lab with the shuttle Discovery and other spaceships attached has been scrapped, NASA officials said. Russian cosmonauts were planning to hop in the Russian Soyuz space capsule, which is currently docked at the station, and circle around the orbiting outpost to snap photos the spaceship family. Yet the Russian Federal Space Agency determined that the safety risk of the jaunt would outweigh the potential benefits, NASA officials said. "They have determined that with the 24 Soyuz, which is the vehicle we were going to go use, they are not in a position to recommend doing the flyabout," Kenneth Todd, space station mission management team chair, told reporters today (March 1) in a press briefing. The photo session, called a "flyabout" in NASA parlance, would have caught an unprecedented sight: Spaceships from four different space fleets – including NASA's shuttle Discovery - linked to the almost-complete space station. But Mission Control radioed the final call to astronauts aboard Discovery and the station earlier today. "The program's official decision is that the flyabout is a no-go," Mission Control told the two space crews. "Every day you're working in low Earth orbit is an exercise in risk management," Todd said. "Is there disappointment? Sure. This would have been something really good for the program and a lot of people to have this image, so there's a little bit of disappointment." Right now spacecraft from the United States, Russia, Europe and Japan are all docked at the space station. They include Discovery, two Russian Soyuz craft, as well as one robot cargo ship each from Russia, Europe and Japan. Never before have four different space fleets been linked together at the same time. The collection of spacecraft represents four of the five major space agencies building the $100 billion space station. Only the Canadian Space Agency, which provided the robotic arms that made the station's construction possible, does not have a spacecraft at the orbiting lab. Adding to the historic occasion: This convergence includes the last flight of shuttle Discovery before it is retired with the rest of NASA's shuttle fleet later this year. That space fact prompted discussions to catch the sight in a photograph. NASA's space station managers and their Russian counterparts had been discussing the potential spaceship "family photo" opportunity for the last several weeks. "This is a unique opportunity that we have here in this particular shuttle mission," Todd said. "There are multiple reasons why this was going to be a good thing to go do." During initial discussions, the proposed flight plan for the flyabout was not thought to be too different from exercises that have been performed before. "It's very similar to some of the Soyuz relocate activities where we need to move the Soyuz from one docking port to another," said space station lead flight director Royce Renfrew. When NASA space shuttles depart the International Space Station, they typically fly around the orbiting lab in a victory lap to take new photos. Once the space shuttles are retired, Russian Soyuz crew will likely have to fill that void, NASA officials said. "Part of the benefits we'll get there is to take an opportunity during this mission to do something that we'll wind up doing eventually," Renfrew added. But in addition to concerns over the newness of the Soyuz spacecraft, NASA and its partners have also traditionally tried to avoid extra spaceship departures or arrivals while a shuttle is linked to the space station. Time constraints also factored into the decision. The flyabout would have added at least one extra day to Discovery's mission. While NASA flight controllers decided to extend Discovery's flight by one day late yesterday (Feb. 28), mission managers want the shuttle astronauts to spend that extra time working on the station's new Leonardo storage module. The Leonardo module was attached to the station today by Discovery's crew. Despite the solid reasoning for canceling the photo op, there is still a level of disappointment, given that it is unlikely the same volume of visiting spacecraft will ever be at the station together again, Todd said. "But like I told the mission management team this morning, we have to respect that this is the right thing to go do," Todd said. "And sometimes the hard questions bring about the answers that not everyone wants." You can follow SPACE.com Managing Editor Tariq Malik on Twitter @tariqjmalik. SPACE.com Staff Writer Denise Chow (@denisechow) contributed to this report from Houston, where she is covering Discovery's final mission STS-133from NASA's Johnson Space Center.